In Darwin’s evolutionary tree, virtually all pickup trucks come from the same branch. It doesn’t matter whether the truck is big or small, or from a Japanese or American brand. They all seem like derivative designs with bulky bodies that ride atop a stout frame designed for towing, perfect for contrabass announcers to brag about in TV commercials. Then there’s the Honda Ridgeline, the duck-billed platypus of pickups. Unlike any other truck on the market, the Ridgeline is built with a unibody design, which means it shares more ancient ancestors with the Accord sedan than with the Ford F-150 or Chevy Silverado. It’s the truck world’s evolutionary oddball. That has some drawbacks, obviously. A separate, massive frame is a major advantage when towing heavy loads, but the Ridgeline doesn’t even pretend to be about towing — at least not at the top of its feature list. Yes, it’s rated to pull a respectable 5,000 pounds with all-wheel drive, which is enough for a lot of boats and Jet Skis but nowhere near what the full-size trucks are pulling these days. That’s just not what it’s built for. 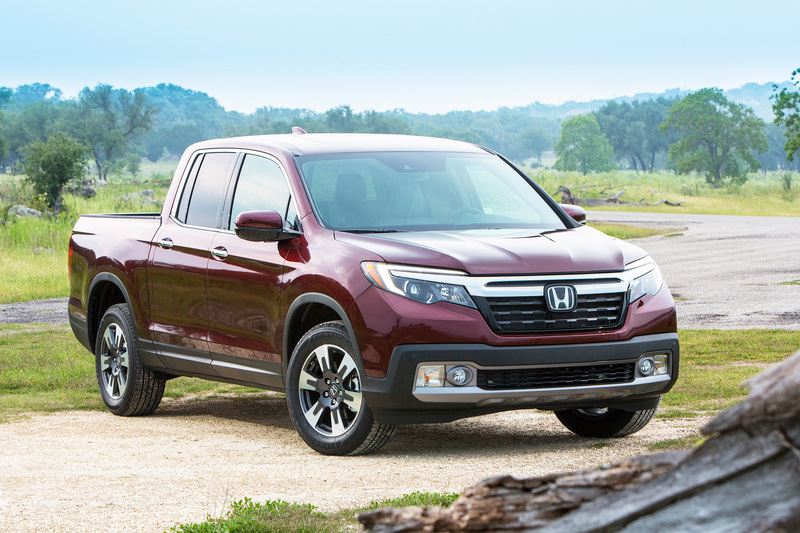 The Ridgeline gets an all-new design for 2017 that makes it clear this Honda truck is like no other. An optional audio system built into the bed and ample storage options make it an intelligent option in a sometimes brutish market segment. Instead, it’s built for over-the-road refinement and everyday usability. The all-new, 2017 Ridgeline’s unibody design has some huge upsides compared to the old-school, body-on-frame trucks. I’ve never driven any truck that comes close to the nice, pleasant, quiet road manners of the new Ridgeline, making it the most car-like truck I’ve ever driven, by far. Its unusual bones also help with gas mileage. The Ridgeline comes with a powerful, 280-horsepower V6 as its only engine offering right now — no little diesels or turbos on tap like some of its competitors — but still manages to get a decent 26 mpg highway rating from the American government. Like the original Ridgeline, it has some unusual features that make the truck more useful, too, including a deep “trunk” underneath the back of the bed and a tailgate that can either lower straight down like a normal truck or swing to the side like a car door. Another cool thing: I think this might be the best truck ever made for tailgating at football games. The Ridgeline’s refined cabin reflects its car-like driving manners. It’s built with tight tolerances and is available with today’s best-designed cell phone integrations, Apple CarPlay and Android Auto. There’s a drain plug in the bottom of the in-bed trunk so you can use it to carry ice and drinks. It’s also available with the Truck Bed Audio System that plays music without using traditional speakers that could get dinged up or soaking wet in the cargo area. Honda came up with the ingenious idea of using what they call “exciters” to vibrate the truck bed sidewalls to make the music, essentially converting the bed itself into a giant speaker. It’s a brilliantly innovative idea. Inside, the Ridgeline is stereotypically Honda-like with tight tolerances and ample, smartly designed spaces for storing things. There’s a big storage bin under the rear sets that lets you carry long things like golf clubs, and the rear seats can also flip up to store something as large and cumbersome as a bicycle inside the cabin. If you’re addicted to your cell phone — and who among us isn’t these days — you’ll love the inclusion of Android Auto and Apple CarPlay in the digital infotainment system. An optional 8-inch touchscreen makes it easy to control the Ridgeline’s myriad digital doodads. Pricing starts under $30,000 and ranges to around $43,000 for the venomous-looking Black Edition with all wheel drive. It’s a car-like truck by design, with a unibody frame that helps it drive more crisply, quietly and efficiently on the road. It’s very innovative in storage and entertainment options, making it a dream truck for tailgating.